While we don’t know for certain that it is number one, we like to think that our new hybrid sedan is one of if not the most fuel-efficient vehicles on the market. It has set all kinds of records and turned all kinds of heads since it was first released, firmly cementing its presence in the segment. How can we feel so confident about that? Well, we’ll show you, by comparing the 2018 Hyundai Ioniq Hybrid vs 2018 Honda Accord Hybrid. The Honda Accord Hybrid has been a dominant force on the segment for a long time, but it rose to the top last year after undergoing to huge redesign that made it both the most powerful and efficient hybrid sedan in its segment. We’ve taken a look at some of the most important specs in a comparison like this and put them into the table below, read on for more details about how these two stack up! 26.5 cu. ft. Cargo Capacity 13.7 cu. ft.
As we said, the Ioniq Hybrid is one of if not the most efficient sedan on the market, and this table takes one step in the direction of proving that. The first row depicts city fuel efficiency, in which the Ioniq Hybrid achieves an extra 8 miles to the gallon. 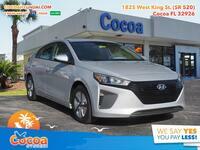 The second row then moves to the highway, giving the Ioniq an even larger advantage via 12 mpg. 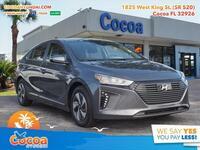 You’re certainly going to travel further for cheaper behind the wheel of a 2018 Ioniq Hybrid than a 2018 Accord Hybrid. However, the Ioniq Hybrid might not be quite as enjoyable on the road, we admit. The Accord Hybrid is still one of the most powerful hybrid sedans on the market with 212 horsepower, a whopping 73 HP more than the Ioniq Hybrid has to offer. But, the Ioniq isn’t just more efficient but more spacious as well, offering nearly twice as much space thanks to its cargo hatch. 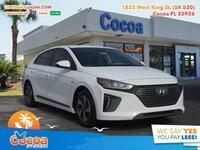 If you’re interested in a 2018 Hyundai Ioniq Hybrid of your own, be sure to get in touch with us one way or another! We’ll get you in the driver’s seat at your earliest convenience.